Over the last couple of sprints on mainstream, Amy and I have been looking into transaction start pages to try to get a handle on the direction we need to take them in. We thought it’d be useful to share some of our discoveries and subsequent thinking. What is a 'start page'? Our first step was to try to get an idea of the kind of things that are currently displayed on start pages and other things that should be considered. Physical documents needed, required numbers etc. We then chose an example transaction to work with. 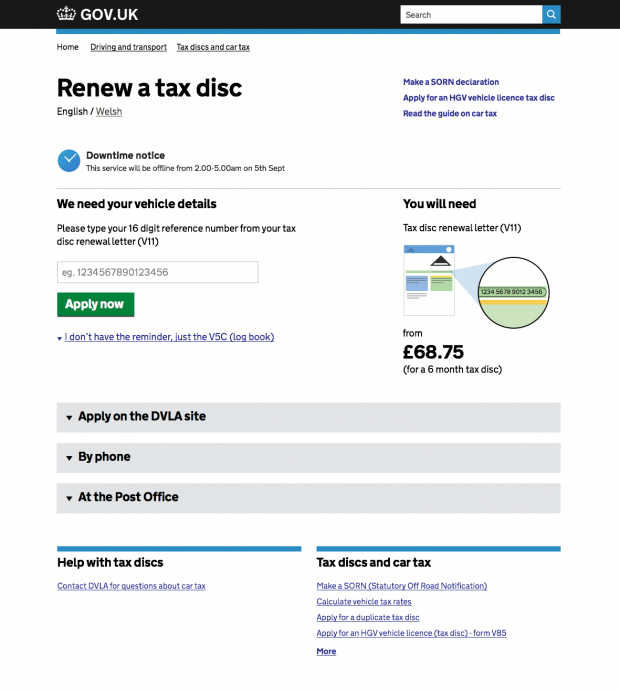 Based on user numbers, we settled on the DVLA, renew a car tax disc as it has the highest volume of traffic of a transaction that is currently being redesigned and not far from releasing. This is how that transaction’s start page currently looks. Based on the variables we'd outlined, we spent a lot of time sketching. 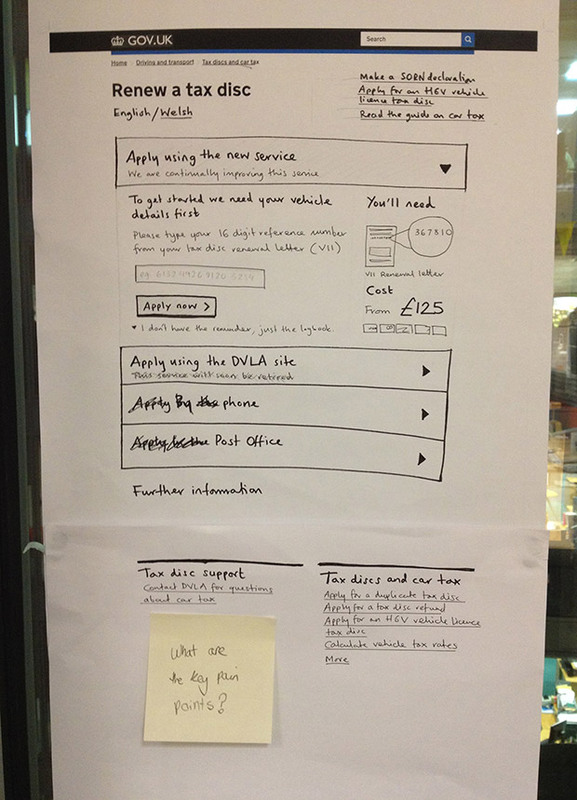 We met with designers and user researchers from other transactions and discussed start pages quite widely as a theme. 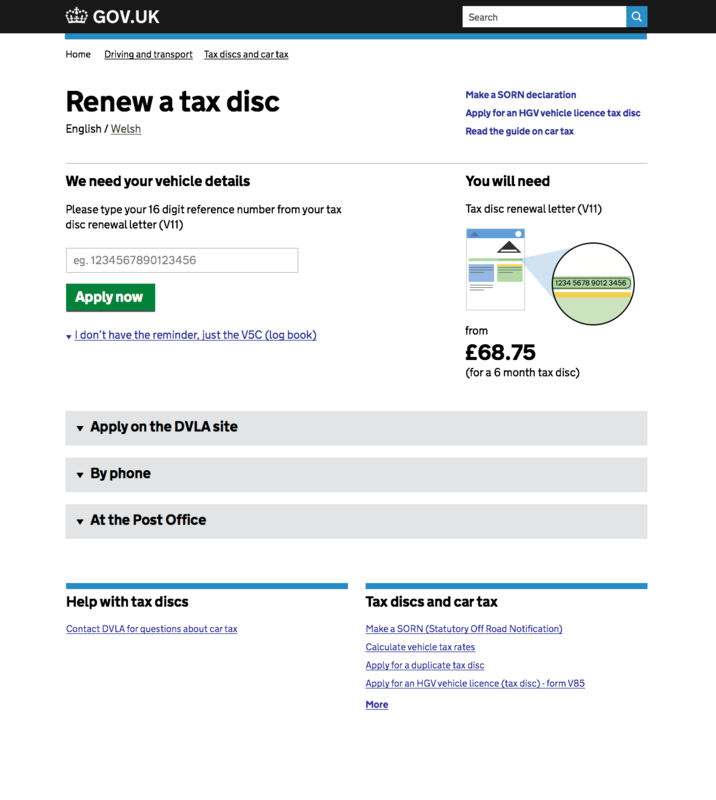 We also spent a lot of time interrogating the renew a tax disc service and John Byrne helped us source analytics data showing its use. The bare minimum eligibility criterion is the 16 digit number, so this is what we use. We favour self certifying eligibility by entering the 16 digit number rather than just showing that the user will need it. While we present optional methods of applying, we confidently lead with one option. Presenting users with an equally weighted choice feels weird. The service has a support/help section at the bottom. If a user is at the bottom, they may need help. WTF is Beta?! Users don't understand this language, we should talk in plain terms. New service is our current term. Start pages are the canonical URL not format. ie. not all start pages must look exactly the same. It depends on the user needs/audience. For anyone that's interested, a lot of this stuff is on the window by Steve Laing's desk in the mainstream team on 6th floor. We're now going to look into four or five more diverse transactions from a mix of departments to explore and test our thinking. We want to see if patterns emerge. We're planning to meet with designers/researchers from those teams and get sketches in front of users in their testing sessions. We also have Jon Sanger helping us with copy to add some rigour to content design. Interesting. 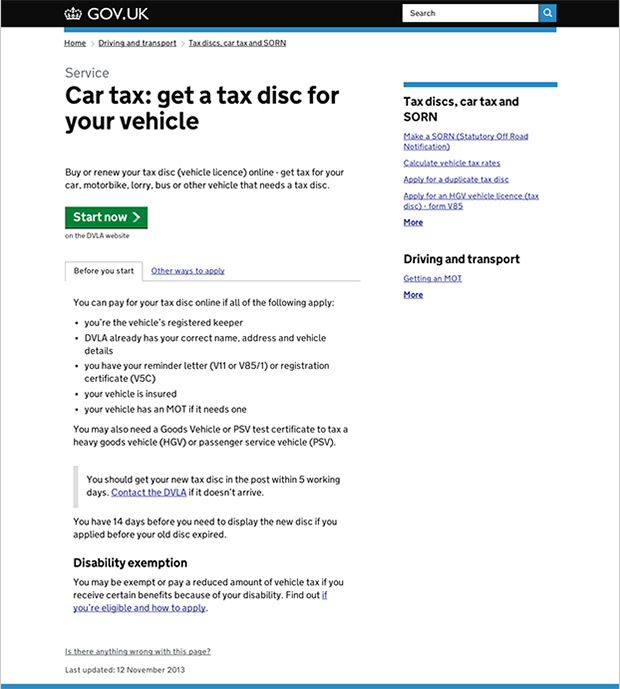 Are start pages for licences in scope for this piece of work? 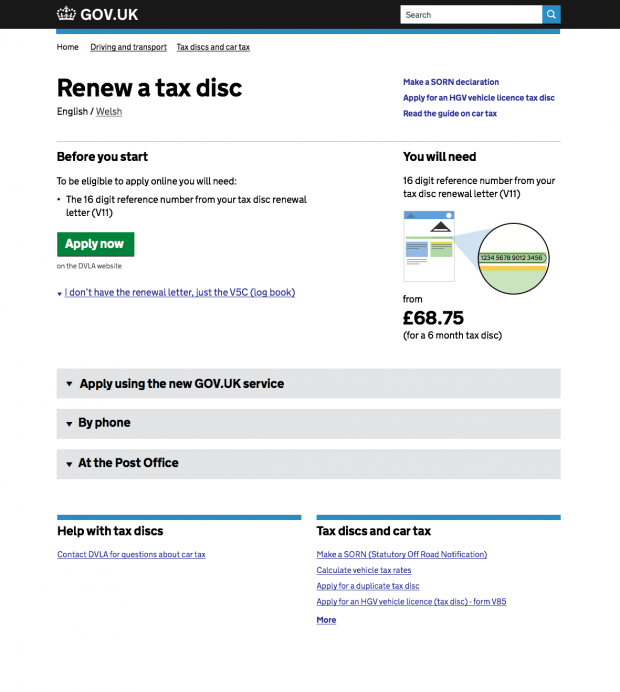 Suspect user expectations may be slightly different than for other types of service - ie do users see the licence itself as a "thing", and therefore expect to apply/update/renew information on the same page? Thanks for the comment and sorry about the slow reply. 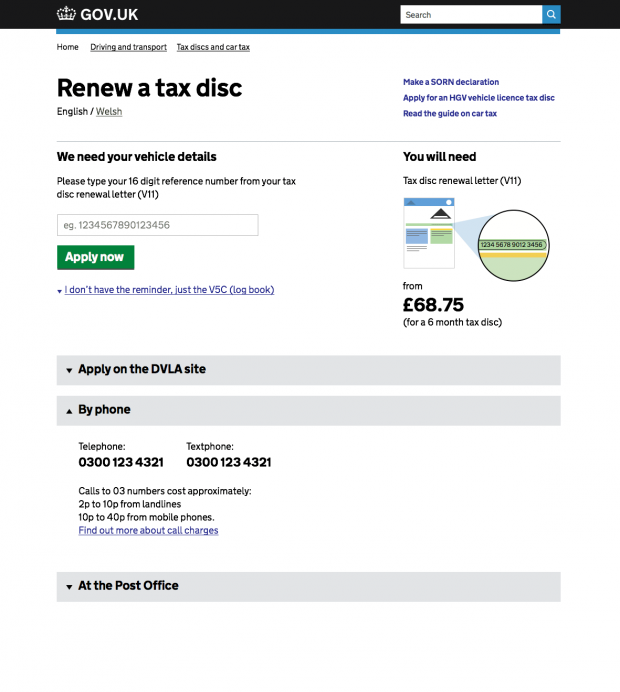 We're not currently looking at licences as part of this piece of discovery work. That said, I'm sure we'll tackle it in time and bear in mind our findings here when we do. One-size-fits-all is definitely not the way to go with this stuff. As and when we do have another look at licences, we'll do further research and testing to get a handle on the best approach.